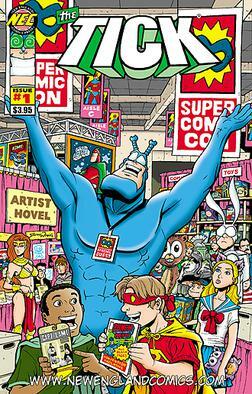 By Daniel Dern: Since I have been buying my comic books at The Outer Limits in Waltham for the past 30+ years, rather than at New England Comics, I was not exposed to NEC’s newsletter mascot, the Tick, nor the ensuing comic books, nor the 1994-1997 animated TV series, although we did watch the 2001-2002 live action, directed by Barry Sonnenfeld (Miller’s Crossing, When Harry Met Sally, A Series of Unfortunate Events — the TV series and the movie), etc., starring Patrick Warburton as the loveable big blue goof. 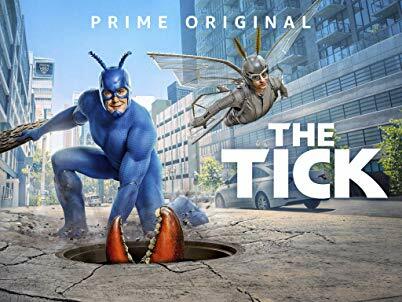 In 2017, Amazon rebooted The Tick as a 25-minute series. It’s arguably grittier than the previous live-action (although, of course, I’d have to rewatch that to verify)… but it’s also got a lot of heart and humanity. And great characters. And speaking to the nature of comic books and superheroes, as large-font subtext, as it were. Enjoyable. Some surprises. Like Expanse book #8, Tiamat’s Wrath, it both starts and wraps up a hornets’ nest of plotlines (including some from the previous season), and positions us (and the various characters) for what looks like should be one heck of a Season 3 (assuming there is one, hope hope). (1) John Hodgman (who some may remember from The Daily Show), who’s been on various other movies and TV shows I mostly haven’t seen (hmmm, including 1 episode of Battlestar Garlictica Galactica) (and Amazon’s Red Oaks, which we did see), has a role throughout this season. Two big goofy thumbs up! This entry was posted in Graphic Examples, Like Show Business and tagged Daniel Dern, The Tick by Mike Glyer. Bookmark the permalink. I might look into it again, but as a fan of the comic and animated Ticks, I was unable to finish the first episode of the first season of this one. It felt as tone-deaf and off the point as a gritty live-action Herbie Popnecker, and I just kept wanting to be somewhere else doing some other thing. I didn’t think it was as good as S1. Kip, agree, this Tick is gritty. I agree that nobody wants a gritty Herbie, since the grit would get over over Them There Lollipops.